Showcase is proud to provide the best in energy efficient windows. Our ratings compete with, and often beat, the best in the window industry. Below, we lay out the reasons this is important. Showcase Custom Vinyl Windows and Doors is a manufacturer in Houston, Texas. We know about the hot and humid regional climate, and we primarily provide our products along the Gulf Coast. We understand that energy bills in this climate can be overwhelming. That is why we focus on having the best Solar Heat Gain Coefficient in the industry. Essentially, solar heat gain is the amount of heat transferred into your home through the windows from outside. This invariably translates into higher energy bills. When shopping for a window, you want the lowest SHGC possible. Turn to our brochures and test data/specs pages to learn more about our favorable ratings. 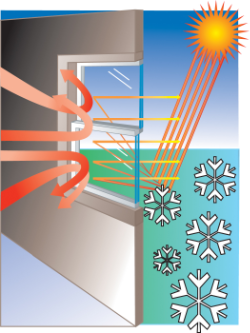 Yet another important factor in energy savings is the air leakage through windows. Showcase has one of the industry’s best ratings with only .07 cfm per square foot for our single hung windows. To meet codes for Texas and along the coast you only need a .30 cfm per square foot rating. Our windows are more than competitive in these areas and provide your family with the ultimate in comfort and low energy bills. Don’t forget the winter! Even though air conditioning costs tend to run up the bill in the hot and humid regions along the Gulf Coast, our windows will save you money in the winter, as well. Keeping the weather at bay will save you money regardless of the outside temperatures. Not only will our windows save you money on your energy bills, but we will lighten your carbon footprint on this earth. The lower your energy bill, the less energy you are using. This helps to save all the natural resources that are so precious. With the simple act of purchasing a quality Showcase window, you can cut down on your energy expenditure and help to preserve the world that we know and love. Lesser windows can allow for a person inside the house to feel discomfort from the outside conditions. For instance, a low quality window allows for the sun rays to pass directly through the glass and warm the individual. This actually creates a discomfort by making the individual feel hot even though the temperature is unchanged. With an energy-efficient window from Showcase you can sit comfortably by your window without having to draw the curtains. This is beneficial in the winter, as well. With a lesser window the cold air outside will cool the glass. As the air inside the house hits the glass, the air cools and drops to the ground creating a current that cools the air in your home more quickly than it should. This creates a cold, drafty sensation, along with making your heater work harder, thereby increasing your energy bill. With Showcase® energy efficient windows, discomfort is no longer a factor. Windows can become foggy when the exterior and interior air temperatures are at a variance. A regular window can turn opaque or streaked from condensation. With a Showcase window condensation is negligible. If you compare a standard aluminum window vs. a standard Showcase vinyl window you can easily see the difference. On a standard aluminum single hung window the condensation resistance value is approximately 12. With a standard Showcase vinyl single hung window, that value is 54. A higher condensation resistance value equates to less condensation. Solar Heat Gain is arguably the largest factor in high energy costs for the Gulf Coast region. That is why we focus on providing protection from solar heat gain. However, under close examination you will find that a window with a low Solar Heat Gain Coefficient can also impede light transmission, thereby decreasing visibility. As with so many other things in life, choosing the right window requires a careful balancing act. This is why, at Showcase, we focus on building energy efficient windows with a low SHGC AND a high visible light transmittance. One of the most important aspects of windows is typically overlooked by the common homeowner. We are referring to the Ultra-Violet (UV) rays that beam through windows into your house. The wood flooring, the carpeting, the furniture and the wall coverings are all affected by the UV rays and will deteriorate over time. The damage incurred and the potential replacement or refurbishing costs can add up to a serious expenditure. With Showcase windows you can keep the view, protect your furniture from fading and save money. Custom Showcase vinyl windows are a major factor in saving money on your monthly energy bills (see Cardinal Energy Calculator ). Because our energy efficient windows keep the air temperature inside the house more stable, the fluctuations in the peak temperatures are better regulated. Therefore, Showcase vinyl windows can lessen the need for a large and costly air treatment unit. Turn to EfficientWindows.org (at the link below) for impartial information on energy efficient windows.